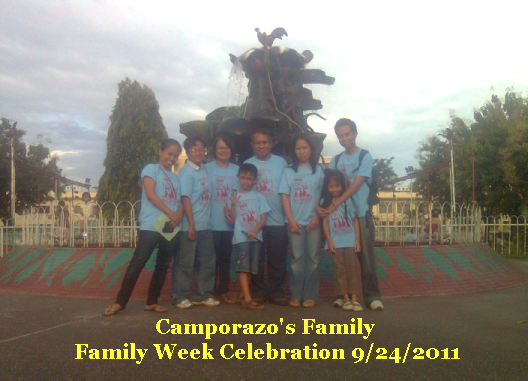 My family and I had a wonderful experience Saturday as we joined the Church activities to culminate the Family Week Celebration. We enjoyed the 45-minute foot parade around the main thoroughfares of La Carlota. The band of selected pupils of La Carlota South Elementary School I led the parade. Rebing, my wife was all smile as I took her picture while strutting along San Agustin Street just a stone-throw away from the meetinghouse. 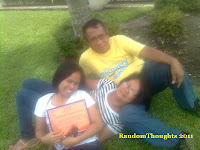 A moment right after the morning session, I playfully laid on the well-trimmed Carabao grass lawn of the meetinghouse to wait the members of my family outside. I was surprised when my wife joined with me and laid on my lap. I was happy and elated. 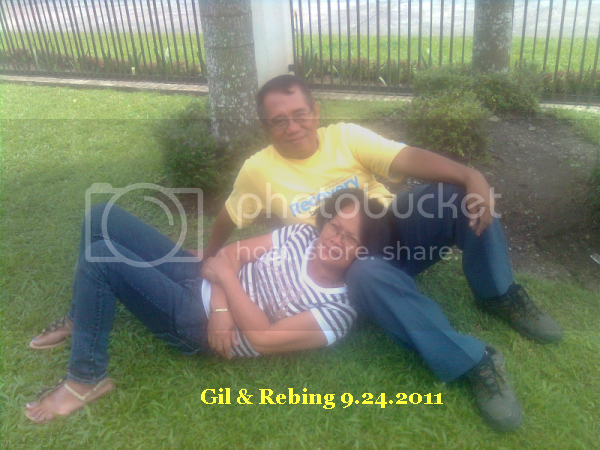 Then followed my youngest son, Gilbor Junior who laid on his mom's side. My youngest daughter, Geeree took her turn too after her brother. At the end of the afternoon activities, we posed for a posterity at the Family Week backdrop. Then we had a snack in one of the fastfood kiosk inside the agora market, 500 meters from the meetinghouse. My eldest daughter who was fetched by her hubby Almon with their tryke, joined with us this time. We're done but time was still early. Then we proceeded to the plaza to pose for a souvenir picture there. Our day is complete. What a happy and blissful occasion indeed! Family is really important. And I know my family could be together forever. What a blissful, wonderful expectation! Hello Gil! Family is indeed important. Which is why quality family time must be valued! You seem to have a big, happy family. So nice! Keep making memories! A salute to the man of the house!! Though I miss my father as I was reading the post.. God bless you more, Sir! i miss my dad.. =) I salute you for keeping the family bond..
what a happy family .you are blessed with a good wife and children .Family bonding time is really important.My eldest like it if we stay in one room ,watch tv or while doing anything and of course going to church together. Seeing you sir with your family reminded me of my dad... What a lovely family you have. i agree, family is really important so we should find time for them even we have busy schedules. i am happy to see families like yours who do bonding moments, really a wonderful moment! Great to see how happy your family is. To be part of a thriving, happy family takes commitment and enormous effort. Glad that you're one! It's good that you value family! It takes a whole lot of sacrifice to raise one. Good job and Good luck! saan po ang church ninyo? @promking if your asking our local Church, it is in La Carlota City, Negros Occidental. We love going out too, even for just a walk or taking photos around the city. Valuing the family will be very beneficial later on...keep it up! That is so sweet of you to spent time with your family! I salute you sir! wow...what a great family you have! family time is a special bonding time! You got a nice family there. It's very pretty to see family who are happy and doing things together. Family comes first before anything else. You guys look like a really happy couple with really blessed family. I wish mine will be like yours..
How I wish I could be like you. it's nice to know that you had a beautiful weekend, sir gil, especially that you spent it with your family. its nice to have a family bonding! brings back all the good memories thats past! and give more strength back. !